Jordan Howard had an excellent day for the Bears. He rushed for 109 yards, and averaged more than 5.0 yards per carry. The Bears’ running back did a good job reading the blocks and finding the open space on Chicago’s zone runs. Furthermore, he also gained crucial yards as he was tough to bring down for Minnesota defenders. Quarterback Mitchell Trubisky had one of the best games of his season and had a very promising performance right before the playoffs. While Trubisky did not have a touchdown pass, he also did not put the ball in harm’s way and made multiple crucial throws on third downs to move the chains. In addition, he was also successful on the ground as he scrambled for first downs on several plays. The Bears’ secondary was simply spectacular in this game and never gave Kirk Cousins or his receivers the opportunity to make plays. The Bears’ starters all made their mark limiting production, making stops on short passes and breaking up passes. The Bears’ pass rush had a favorable matchup and they took full advantage. The down linemen collapsed the middle of the pocket while Khalil Mack made his presence felt despite plenty of help from tight ends & backs off the edge. The Bears’ coverage unit was at its best and they meshed perfectly with a stellar performance from their friends in the on the line. In a crunch situation, Kirk Cousins came up short for the Vikings. The platform wasn’t the best for him again, as he was under pressure on around half of his snaps, often straight up the middle flushing him to the Bears’ edge rush. Throws that where there to be made were missed and ultimately, he couldn’t make plays against a suffocating Bears coverage unit. The Vikings’ pass protection issues started through the middle with an Eddie Goldman sack in the first quarter and things didn’t improve much from there. Center Pat Elflein is among the league leaders in pressures allowed at his position and after a solid last three weeks, he chose a poor time to turn in one of his worst games of the season. The Vikings have devoted resources to their offensive line in recent years, they need to do so again if this offense is to improve next season. The Minnesota defense failed to make key stops when it was really needed in this game, and there were not many outstanding performances on the defense. However, Linval Joseph‘s play was one of the few bright spots. Joseph constantly won his battles against Chicago’s guards, as they were unable to move him on run plays. 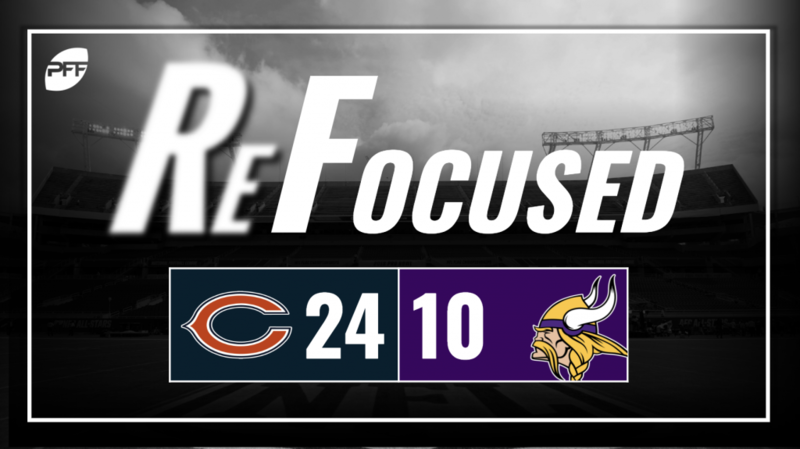 Despite Joseph’s solid play, the Vikings were unable to slow down the Bears running attack, which was mainly due to the subpar performances of the Minnesota linebackers. Vikings linebackers Anthony Barr and Eric Wilson struggled to come off blocks and had a hard time stopping Jordan Howard. Chicago: The Vikings were unable to stop Chicago’s running attack. However, even when they slowed down the Bears, quarterback Mitchell Trubisky made key plays for the Bears offense to move the chains and extend drives. Minnesota: Faced with a team that ultimately had nothing to play for, the Vikings’ offense simply couldn’t deliver when it mattered.